Ocho Rios (Spanish for "Eight Rivers") is a town in the parish of Saint Ann on the north coast of Jamaica. Just outside the city, travelers and residents can visit Columbus Park, where Columbus supposedly first came on land, and see maritime artifacts and Spanish colonial buildings. It was once a fishing village but now caters to tourists. It is a port of call for cruise ships as well as for cargo ships loading sugar, limestone, and in the past, bauxite.Scuba diving and other water sports are offered in the town's vicinity. The name "Ocho Rios" is a possibly misnomer, as there are not currently eight rivers in the area. It could be a British corruption of the original Spanish name "Las Chorreras" ("the waterfalls"), a name given to the village because of the nearby Dunn's River Falls. The North Coast Highway from the international airport at Montego Bay to Ocho Rios has been improved since 2007 and the journey is now an hour and forty five minutes drive. On 26 August 2011, the Jamaican government announced a $21 million revitalization plan for the resort area. Since March 2016, with the opening of the North-South portion of Highway 2000 (whose North terminus is located at Mammee Bay, a suburb of Ocho Rios), driving and commute times into the nation's capital, Kingston, has gone from over 2 hours to a little under an hour. The opening of this highway has reduced traffic on the old route between Jamaica's two cities (through the town and onto Fern Gully) immensely. The town has restaurants, and in Margaritaville and Dolphin Cove nightclubs where tourists swim and interact with dolphins. Another major point of interest is Fern Gully. Fern Gully is the result of a 1907 earthquake that destroyed one of the river beds in the area. Fern Gully stretches about 3 miles of great rocky gorge where travellers can see over 540 variety of ferns. In 1907, the British government paved over the destroyed river bed to create what is currently known as The Fern Gully Highway. The town was a shooting location during the filming Dr. No, the first James Bond film, released in 1962. The Sans Souci hotel was used as the exterior of the Blue Mountain cottage, the home of Bond villain Miss Taro. A decade later, the town was used again in a Bond film, this time 1973's Live and Let Die. James Cameron's first film, 1982's Piranha II: The Spawning, was filmed at the Mallards Beach-Hyatt Hotel in Ocho Rios, which doubled for the film's Club Elysium. 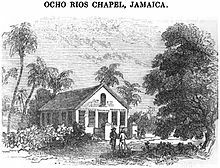 ^ "Ocho Rios Chapel, Jamaica". Wesleyan Juvenile Offering. London: Wesleyan Methodist Missionary Society. VII: 80. July 1850. Retrieved 19 November 2015. ^ "Where to visit: Ocho Rios". Visit Jamaica. 2010-11-20. Archived from the original on 2011-08-30. Retrieved 2011-09-15. ^ "165 Search Results for "Ocho Rios"". Visit Jamaica. Retrieved 11 May 2017. ^ Caribbean Port Reviews, Ocho Rios. Caribbeanportreviews.com. Retrieved on 2011-09-15. ^ "Development of the Bauxite/Alumina Sector". Jamaica Bauxite Industry. Retrieved 11 May 2017. Reynolds began exporting bauxite from Ocho Rios in June 1952, and Kaiser followed a year later from Port Kaiser on the south coast. ^ Davis, Carlton E (2012-06-06). "60 years of bauxite mining in Ja – Part II". The Jamaica Gleaner (2012-06–06). Retrieved 11 May 2017. All three of the founding companies have since left Jamaica: Reynolds, in 1984; Alcan, in 2001; and Kaiser in 2004. ^ The Town of Ocho Rios, Jamaica. Mobay.com (2011). Retrieved on 2017-05-11. ^ Maresca, Frank; Ricco, Roger (1982). The James Bond Films. Random House Value Publishing. p. 19. ISBN 0517548240. Retrieved 2018-12-12. ^ Burlingame, Jon (2012). The Music of James Bond. Oxford University Press. p. 116. ISBN 0199986762. Retrieved 2018-12-12. ^ Hughes, Howard (2011). Cinema Italiano: The Complete Guide from Classics to Cult. I.B. Tauris. p. 279. ISBN 0857730444. Retrieved 2018-12-16. ^ "Ocho Rios All Inclusive Family Resort in Jamaica – Beaches Ocho Rios Resort & Golf Club". All Inclusive Resorts and Caribbean Vacations for the Whole Family – Beaches Caribbean Family Resorts. Retrieved 10 August 2015. ^ "Couples Resorts – An All-Inclusive Couples Resorts in Jamaica". Retrieved 7 September 2017. ^ "Rooms on the Beach – The Best Hotel Deal in Jamaica". Retrieved 10 August 2015. ^ "ClubHotel Riu Ocho Rios – Jamaica All Inclusive Vacations – RIU Hotels & Resorts". Retrieved 10 August 2015. ^ "Jamaica All-Inclusive Resort – The Jewel Dunn's River – Ocho Rios Jamaica". jewelresorts.com. Retrieved 10 August 2015. 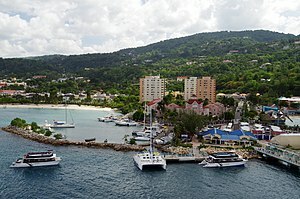 Wikimedia Commons has media related to Ocho Rios. Guava Jelly Guide — "Shake hands with the whole of Ochi!"